Bolle delivers optimal performance and maximum comfort in one ruggedized package with the Recoil Shiny Black Polarized Blue Sunglasses. Engineered for athletic use, the glasses feature an ergonomically-shaped frame that naturally compliments the shape of the face for a secure fit. Arched arms employ a Thermogrip over-mold that grips the face to keep sunglasses firmly in place while running, biking or climbing. Impact-resistant lenses are polarized and offer 100% UVA and UVB protection. 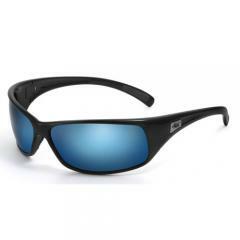 Added blue tinting reduces glare and enhances color perception while giving wearers a trendy, sporty appearance.